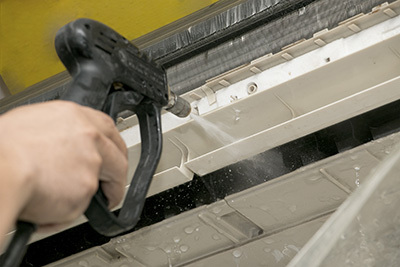 One of the most important air duct maintenance procedures is cleaning. It's best to first identify the most contaminated areas. Read about the importance of air duct cleaning and why it makes a difference to have humidifiers at work. Air duct repair tips and ideas for your comfort. Read more below. Air Duct Cleaning Playa del Rey technicians always advise homeowners to identify the source of air duct contamination before starting work. Contaminants like dirt, dust, moisture, water and other debris should never enter the duct system in the first place. Then a routine maintenance program should be adhered to all the time. If the heating system at home has a de-humidification component in the ducts then home owners should always be extra careful in handling and maintaining it. It should be maintained as per the instructions provided by the manufacturer and operated correctly too. HVAC systems work most hours of the day, especially in working places. When you fail to do HVAC unit cleaning often, you run the risk of encountering serious problems later that will cost you more. Plus you pay more for energy and don't enjoy a warm, clean environment. Sometimes it isn’t enough to simply use a brush when cleaning air ducts or their grates and grilles. When there happens to be too much dust or even grime, then it becomes necessary to make use of soap and water to do the trick. When you keep the water pressure of the hose medium, you will be able to remove all the dust, dirt and debris stuck between the coils safely. If you use a pressure washer, on the other hand, you will most certainly bend some or most of the coils. This will make the outdoor HVAC much less efficient.